The constituency mentioned must comprise of politicians and not the residents of Kibera because Mr. Odinga’s ODM/CORD secretariat was run by old/disconnected politicians. Yes he may have had administrators running the back office but the face of the ODM operation was one Franklin Bett, a veteran politician that elicited a lot of distrust from voters and presided over a sham of a nomination process. President Kenyatta’s Jubilee coalition was the polar opposite. Youthful Johnson Sakaja and Onyango Oloo presented a face of professionalism in the management of TNA affairs. TNA also had a rather chaotic nomination process, but Sakaja and Oloo seemed to be in charge and gave the impression of being fair arbiters. For instance, they allowed Ferdinand Waititu, a stone thrower, to run against Evans Kidero for the governorship of Nairobi when they could have rigged in Jimnah Mbaru, a much better candidate. Over at ODM Raila Odinga’s brother and sister were fighting nasty nominations in Siaya and Kisumu respectively, which gave people the impression that the party wanted to rig in Raila’s relatives. Mr. Odinga’s lack of managerial abilities was also displayed in the choice of his son (Fidel) as controller of the purse for some campaign operations. An ODM operative in the Kidero campaign intimated to me that some of the money was never used and that t-shirts intended for campaigns were kept in storage in readiness for Raila’s swearing in! Mr. Odinga’s wife also ruffled a few feathers during the campaign period. The heavy visibility of his family made it much harder to avoid seeing Mr. Odinga’s campaign as a family affair. Raila Odinga’s campaign had several strategic blunders, going back a few years. If Raila Odinga had garnered at least 20% of the vote in Kalenjin land in the Rift Valley province we may be having a different discussion today. His dismal showing in the Kalenjin heartland was partly because of his strategic myopia with regard to the eviction of squatters in the Mau forest. The cabinet, which at the time included William Ruto, Uhuru Kenyatta and Mwai Kibaki, approved the plans to preserve the Mau forest water tower by evicting those who were squatting in the protected areas. Yet, Raila Odinga managed to allow himself be left holding the political bag for the evictions (Many of those who lost land in the process were actually wealthy land owners with thousands of acres). Come election time four years later, one of the issues that arose was why the poor who were evicted had not been resettled. At the time Mr. Odinga, through James Orengo, was in charge of the lands ministry. Instead of addressing the issue head on politically, the Odinga camp kept saying that treasury (run by Kenyatta then later by his allies) was witholding funds to resettle the evictees, thereby walking right into the political trap. What stopped Orengo, the lands minister, from allocating land to the evictees, thereby forcing treasury to rescind this offer or worse to evict the people from their newly allocated land? TNA completely outmaneuvered ODM in registering voters in their strongholds. Local political analyst Mutahi Ngunyi (of the tyranny of numbers fame) was partly right when he said Kenyatta won the election on December 18, the day voter registration closed. Again here Odinga could have done better. Many youth in his strongholds did not register for lack of national identification cards. 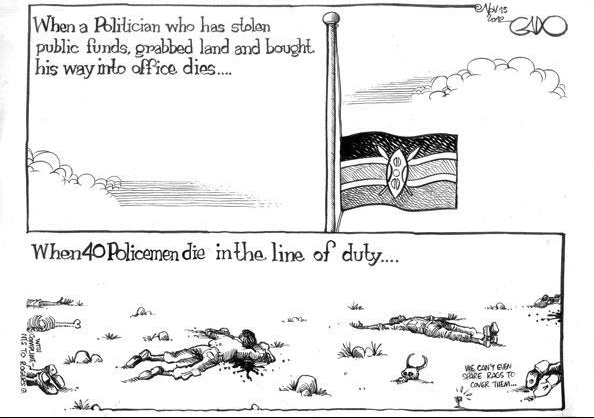 Yet Mr. Odinga controlled the ministry in charge of issuance of IDs through Otieno Kajwang’. Why didn’t Odinga mobilize his base to register? My theory is that his lieutenants’ incentives were misaligned with his. While Mr. Odinga needed massive grassroots mobilization, his old and disconnected close associates dreaded this. Many of them were very good at playing politics at the national stage but did very little for their constituents upcountry. Massive voter registration would have undoubtedly meant defeat for this lot (quite a few of them won nominations under dubious circumstances). Mr. Kenyatta on the other hand was less encumbered by old established politicians since he had a brand new popular party (TNA) in which everyone who wanted to be elected in central Kenya had to join. The same Odinga lieutenants also appeared to be ever too eager to pursue their own interests at the expense of the former Prime Minister. Prof. Anyang’ Nyong’o threatened to fire 3,000 nurses close to the election, and called them zombies. One Jakoyo Midiwo, a vocal MP from Nyanza province and Odinga’s nephew, said that ODM had its owners and that Mr. Odinga’s brother (Oburu Odinga) was the designated nominee for governor of Siaya. He advised those who did not like this idea to look for other parties. Many analysts concluded following the election that Kenyatta and Ruto won partly because of their strategic use of the cases they face at the ICC. I hold the position that the ICC only made it more likely that Uhuru would team up with Ruto. The advantage here could have gone either way. Late last year opinion polls were still showing at least 50% of Kenyans wanting perpetrators of the 2007-08 violence to be prosecuted at the ICC. Mr. Odinga could have used this to his advantage by going directly to the voters most likely to be sensitive to international trade restrictions – many of whom were in Kenyatta and Ruto’s strongholds (mostly commodity exporters) – and making the case to them that electing the duo would negatively impact their businesses. Instead he completely gave up on this and allowed Kenyatta to own the issue and set the tone on how the ICC would be talked about in the campaigns. As a result in the first debate Mr. Kenyatta masterfully neutralized the ICC cases as an issue by forcing all serious contenders on stage to denounce the trials and pledge to try the suspects of the 2007-08 violence domestically. Uhuru Kenyatta is one of the wealthiest people in Africa (probably worth hundreds of millions of dollars). He was therefore able to pour money into his campaign without reserve. Red t-shirts, caps, reflector jackets, lesos, etc were everywhere. ODM on the other hand had the reputation of being stingy throughout the campaign. They had less money to work with and even then managed to mismanage the little they had. Mr. Odinga’s dependence on wealthy party financiers may have also hampered his independence leading to the many strategic blunders he made throughout the campaign. In the final analysis democratic elections are about numbers. And sometimes a candidate just doesn’t have the numbers. Kenyans vote along ethnic lines. And on this score Mr. Kenyatta had a head start. The two core communities of the Jubilee Alliance (Kikuyu and Kalenjin) make up 36.5% of Kenyans. The two core communities in the CORD Alliance (Luo and Kamba) are only 21.1%. Add this to the fact that Mr. Kenyatta completely out-registered Mr. Odinga and also had a better turnout on voting day (I hinted at this here before the election) and it becomes clear why Mr. Kenyatta’s margin of victory was so big. Mr. Odinga’s party needs to do a lot of soul searching and be honest in its assessment of the conduct of the last election. They were caught flatfooted, playing the politics of yesteryears – mass rallies and whipping up emotions – instead of meticulously planning and targeting voters for registration, turnout, and with specific messages. Mr. Kenyatta, perhaps because he had a lot more to lose if he lost, or because he had a newer party with immense resources, or both, was able to do these things very well. Elections in Kenya will forever be different. And a lot more expensive. Today Ipsos Synovate provided their own internal analysis (see here, pdf) of the election results vis-a-vis their poll numbers right before the March 4th election. According to the final IEBC tally (Which Mr. Odinga is challenging in court) all the eight candidates except Mr. Kenyatta performed within the margin of error of Ipsos’ last poll before the election. Mr. Kenyatta outperformed the last poll by 5.25%, well outside the margin of error. How did Ipsos miss this? Their answer on page 23 basically agrees with my observation that differential turnout, especially in the candidates’ respective strongholds, made the difference. According to the final IEBC numbers, Mr. Kenyatta’s 20 biggest vote-basket counties averaged a turnout rate of 88%, compared to Mr. Odinga’s 84%. In related news, tomorrow Mr. Odinga will officially file the petition that seeks to nullify Mr. Kenyatta’s election as president. CORD may seek the nullification of the whole election or narrow their challenge to just whether Mr. Kenyatta actually crossed the 50% threshold. Crucial figures to think about as we await to see the content of the petition tomorrow are (1) 10.6m votes were cast in the 47 governor races compared to 12.3m in the presidential race, a difference of 1.7m votes; and (2) Mr. Kenyatta crossed the 50% threshold by less than 10,000 votes. The United States and others may have limited leverage over Kenya’s domestic politics, but they are not without options that would significantly improve the prospects for acceptable elections and help avert a major crisis. However, with little more than two months before the elections, Washington must intensify its engagement or forsake its opportunity to make a difference. But the window might be closing fast on the international community to help Kenya avoid a repeat of 2007-08, when 1300 died and 300,000 were displaced after a bungled election. According to a report by the Global Commission on Elections, Democracy and Security (yours truly was a research assistant for the commission), evidence suggests that international interventions to encourage reasonably free and fair and peaceful elections are most effective when done well in advance to the polling day. In the Kenyan case, the structural causes of previous rounds of electoral violence were never addressed, and may yet lead to the loss of life this election cycle. What can now be done to avoid large scale organized violence is to credibly convince the politicians and those who finance youth militia (chinkororo, taliban, mungiki, jeshi la mzee, baghdad boys, etc) that they will be held accountable. So far, as is evident in Tana River and the informal settlements within Nairobi, the lords of violence appear to be operating like it is business as usual. “Long-standing competition and conflict over access to pasture and water resources were important factors, but did not alone provide the trigger for violence. A range of political and economic factors have fed into the local dynamics in Tana Delta. These include longer-term trends related to alienation of local people from land due to large-scale government and private sector purchases, and shorter-term impacts related to the process of delineating electoral constituency boundaries and county districts in line with Kenya’s new constitution. The ready availability of small arms has also seen such conflicts intensify in recent decades. Lack of livelihood opportunities for the youth is also a major factor. The Tana Delta conflict is symptomatic of a larger dynamic that will play out in anticipation of the March 4th 2013 elections in Kenya. The new constitution has created 47 county governments, many of them multiethnic or otherwise diverse, that will each have three county-wide elected officials (a governor, deputy governor, and a senator). Ethnic and communal rivalries will inevitably surface in these county contests, with potentially disastrous outcomes such as what we’ve seen so far in Tana River County. The potential for decentralized violence in Kenya’s 47 counties is a real cause for concern. In order to limit the potential for violence, the national commission charged with policing ethnic harmony has initiated talks in potential flash-points to broker inter-ethnic power-sharing deals with the hope of avoiding a situation in which certain communities are totally excluded from county-wide elected offices. Sadly, so far there is no sign that these initiatives will work (Not to mention how un-democratic such back room arrangements will be). Plus the violence will not necessarily be exclusively of the inter-ethnic variety (which is what the commission is fixated on at the moment). Even ethnically homogenous counties might experience inter-clan violence. While most of the attention in the next few months will be on how to avoid a repeat of the aftermath 2007-08 election, Kenya watchers should be warned that the problem will be much more complicated. If nothing is done, many counties will experience inter-communal violence. The new county governments will have real resources (about a third of national revenue) that will generate real patronage networks worth fighting for. Given the nature of Kenyan politics, the race for the presidency (more blog posts on this soon) will inevitably hog all the attention in the next five months. I hope the contest for State House and its own risks for violence will not overshadow the county-level contests which will also be just as intense and likely to result in violence. With just under four days to go, there is still no clear front-runner in the upcoming general elections in Kenya. According to the latest opinion polls, there is a statistical tie between the incumbent President Kibaki and the veteran opposition politician Raila Odinga. Many observers have acknowledged that this is going to be a very closely contested election and therefore there is need to keep it absolutely free and fair because whoever wins will not do so with a wide margin – unless we have been fooled all along by the opinion polls, a fact that is not entirely implausible since statisticians have been known to get it wrong some times. Statistics and opinion polls aside, the whole world is watching; which gives Kenya an opportunity to demonstrate that true democracy can flourish on the continent of Africa. The onus is on the electoral commission of Kenya to ensure, as they have guaranteed, that there are no irregularities in the December 27th poll. Only then will the losers of the election concede defeat respectfully and allow the country to move forward with whoever gets elected as president. Even though the two major parties do not differ much in terms of their ideals and the contents of their manifestos, I think electioneering is still an invaluable process because it gives a sense of empowerment to the majority of voters since it makes them engage their leaders and feel as part of one country, even if just for the brief period of campaigns and emotionally charged political rallies as we have witnessed in the last three months. May Kenya emerge on the 28th of December a united and peaceful nation state ready to move forward with a sound development agenda.